Happy Birthday Author: Valentine's Day Story and a few Shout-Outs! Valentine's Day Story and a few Shout-Outs! Susanna Hill, author of Punxsutawney Phyllis and Can't Sleep Without Sheep, hosted a Valentine's Day writing challenge. The task was to write a story about unlikely Valentine's in 200 words or less. I hope you enjoy my story coming in at 196 words. I call it Puffy Pancho and Pretty Paulita: The Perfect Penguin Pair. Pancho lived at the zoo with his best pal Paulita. Every day they played in the pool, posed for pictures, and ate plenty of fish. Pancho’s parents and Paulita’s parents thought they were the perfect pair. Pancho planned to propose to Paulita on Valentine’s Day. He found the perfect pebble. He picked the perfect place. Pancho was prepared to pick Paulita as his perpetual partner. The morning of Valentine’s Day was peaceful and pleasant. Pancho was peppy and perky until he peered in the water. The reflection showed plumage that looked puffed and plucked. Pancho panicked and plunged into the pool. Pancho prayed that the water would make his plumage proper. He knew his plumage still had problems when he saw the patrons pointing. Pancho popped out of the water and plodded to his pen. He picked up his perfect pebble. He peered at the perfect place. Paulita was perched in position and looked very pretty. Pancho paused, preened his plumage, and pranced to the perfect place. He presented the perfect pebble and Paulita was pleased. Pancho was proud as he posed for pictures with Paulita. He didn’t even mind when she preened his puffy plumage. Additionally, in the past week I was awarded two blogging awards by new friends in the 12 x 12 Challenge. 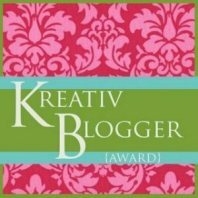 Joanna Marple of Miss Marple's Musings awarded me the Liebster Award and Anna Coates of Green Tea and Toast awarded me the Kreativ Award. Thank you so much! I think I was supposed to do five, but I couldn't narrow it down! I hope you find these blogs as enjoyable as I do! You simply can't go wrong with penguins! Cathy -- I worked at a zoo for two summers. One of my favorite things about my job was talking about the penguins to zoo patrons. I most definitely agree that you can't go wrong with penguins. Awww. Thanks for the award Eric. I enjoy reading your blog as well. And your tongue twisting penguin tale is fantastic! Nice work! You're welcome for the award. It has been a pleasure getting to know you through 12 x 12. Thank you so much for the positive comments on my story. Big congrats on your award! And thank you for passing it my way. Thanks Jennifer! I just read an e-book by Josh Alves (I think he is in 12 x12) and it was alliteration. I had been wanting to try it too. The thesaurus was a big help! Pleased with your positive praise! Thank you! Well, I would say positively perfect, but that's been done :) Pleasantly Pulled-off? Peerlessly Presented? Fun story, and love the alliterative ps :) Thanks so much for entering! Thanks for hosting the challenge! It was a lot of fun! Thank you for precious perception! This is almost as good as the story-fun! Thank Renee! Penguiniferous certainly sounds like a good thing! OK-this story is awesome, Eric! What fun it would be to illustrate! Well done. Love it! So cute! Perfect pacing! Poor Pancho with his puffed and plucked plumage. Thank goodness Paulita isn't particularly picky! It is so pathetic when the penguins molt. Paulita really is a saint! Thanks for the compliments! Your penquin story is delightful! I love penguins, almost as much as teddy bears. Thanks Darlene! I really enjoyed your story too! Count me as another penguin lover! There is just something so irresistible about them. I also really liked your choice to fill the story with p-words, what a fun writing exercise. Good job! Amy D -- Penguins are fascinating. When I worked at the zoo -- I loved watching penguin parents care for their young. I was able to watch a few chicks grow up. The parents are so protective. Loved every minute of my job! Thanks Vivian! I certainly could write a dozen stories. So many interesting things happen while working at the zoo -- disappearing tortoises, taking ducks for walks, making birthday presents for a bear! So much fun! A ppperfect read for a Valentine's morning. And, I love the penguins. Happy Valentine's Day. Happy Valentine's Day Stacy! Thanks for reading my story! Cool! I like the constant "p" words.